THE HYPOCRISY IN SSS INVITATION TO APOSTLE JOHNSON SULEIMAN WHILE LEAVING OUT ZAHRA BUHARI, SULTAN OF SOKOTO, AND NASIR EL RUFAI. The Indigenous People of Biafra (IPOB) have viewed with disdain and as an act of hypocrisy, the invitation of Apostle Johnson Suleiman to State Security Services (SSS) Headquarters in Abuja on Monday, January 30th, 2017 by 10 am. The SSS who unilaterally and illegally assumed the name “Department of State Services (DSS),“ has invited Apostle Suleiman because he advised members of his church to exercise their UN-approved and inalienable fundamental human right of self-defence if attacked by Islamic terrorists. It is worthy to note that this invitation by the SSS came after the Sultan of Sokoto, Alhaji Sa’ad Abubakar III, called for the arrest of Apostle Suleiman. In a tweet in 2012, Mallam Nasir El Rufai stated as follows: “We will write this for all to read. Anyone, soldier or not, that kills the Fulani takes a loan repayable one day no matter how long it takes.“ We further remind the world that the public relations officer of Southern Kaduna Peoples Union (SOKAPU), Mr Yakubu Kuzamani, accused Mallam Nasir El Rufai of engaging in hate speech while El Rufai was speaking on an Aljazeera Television programme on Tuesday, 17th of January, 2017. In all these three examples, the common thread is hate speech and incitement of Muslims against non-Muslims. But in all the three, none of the perpetrators of the hate speeches has been invited by the SSS. Then, why is Apostle Johnson Suleiman being singled out for investigation by the SSS? Why did the SSS not invite Zahra Buhari (now Mrs Zahra Indimi) for her hate speech? Why did the SSS not invite Alhaji Sa’ad Abubakar III, Sultan of Sokoto, for his hateful and inciting speech? Why has the SSS not invited Mallam Nasir El Rufai for his hate speech that was even announced by SOKAPU? We are appalled that the National Assembly of Nigeria has not called the SSS to order as they engender tyranny and religious bigotry. Why will the National Assembly keep quiet as the SSS allow those with Islamic linkage to freely dish out hate speeches and incitements to commit violence while inviting Christians like Apostle Johnson Suleiman who resort to universally-acclaimed rights to self-defence? The indifference by Nigeria’s National Assembly is a key reason why Africa, in general, and the black race, in particular, are underdeveloped and filled with dictators and life-presidents. It is also very worrisome that Theresa May and her British Government do not see anything wrong with the current persecution of Christians in Nigeria. This is the same Theresa May who spoke through Boris Johnson to plead for Christians implicated in the failed coup in Turkey. We also remind the world that it was the British that brought Anglicanism to Nigeria but is now working with Moslems to exterminate Christians. We also recall that Catholicism came from Rome (Italy), Pentecostalism and Baptist Mission came from the USA, the Lutheran church came from Germany, and Presbyterian and Methodist missions came from Scotland. These countries have their Embassies/Missions in Nigeria but have all kept silent as Muslims go on a rampage against Christians, now culminating in the invitation of Apostle Johnson Suleiman to SSS Headquarters in Abuja for questioning and possible long-time detention. With the silence of these countries, we are bound to ask if they are only interested in the money they make from church members in Christendom in Nigeria. Why must Muslims be the only people with the unfettered license to hate speech and violence? Why is the British Government so intensely glued to Islam and highly supportive of their violent ways? What is is it in Islam that the British Government enjoys that they are always supporting Islamic countries but working against existing Judeo-Christian nations or those agitating for their nations such the Biafrans? Why is the British Government so much in love and in bed with Islam and radical Islamism? Why will the British Government, a supposedly Christian faith based Government, keep quiet and watch Apostle Johnson Suleiman railroaded into the SSS detention cell, come Monday, January 30th, 2017? The Indigenous People of Biafra (IPOB) call upon humanity to prevail upon the British Government, who we all know dictate what happens in Nigeria, to stop their anti-Christian behaviour towards Christians in Nigeria and that they should request the SSS to call off the planned questioning and detention of Apostle Johnson Suleiman. 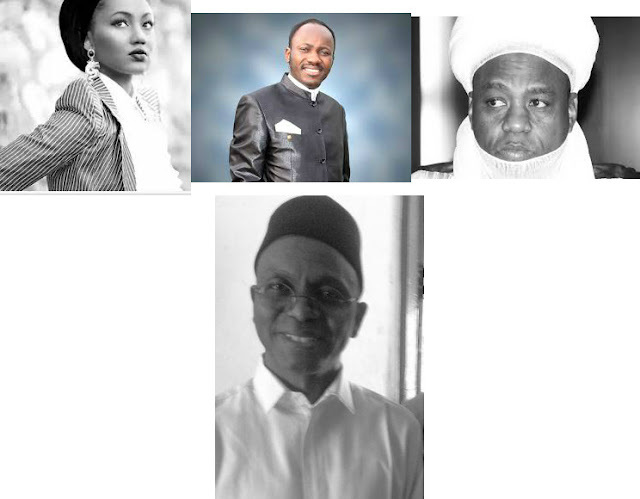 If there are people that should be invited by the SSS with a view to questioning and detention for hate speeches, they are Zahra Buhari-Indimi, Sultan of Sokoto (Alhaji Sa’ad Abubakar III), and Mallam Nasir El Rufai. Doing otherwise is pure hypocrisy.